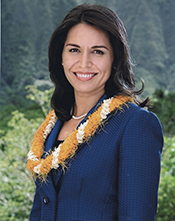 GABBARD, Tulsi, a Representative from Hawaii; born in Leloaloa, American Samoa, April 12, 1981; B.S.B.A., Hawaii Pacific University, Honolulu, Hawaii, 2009; member of the Hawaii state house of representatives, 2002-2004; Hawaii Army National Guard, 2003-present; staff, Senator Daniel Kahikina Akaka of Hawaii; member of the Honolulu, Hawaii, city council, 2010-2012; elected as a Democrat to the One Hundred Thirteenth and to the three succeeding Congresses (January 3, 2013-present). "Tulsi Gabbard" in Asian and Pacific Islander Americans in Congress, 1900-2017. Prepared under the direction of the Committee on House Administration by the Office of the Historian and the Office of the Clerk, U.S. House of Representatives. Washington: Government Publishing Office, 2018.